The Islanders are going through a rough slump. In fact, they’ve been pretty terrible for a few weeks. You can look at almost every aspect of the team right now and find something to improve on. Instead of running through the laundry list of “have tos” that the team needs to achieve, let’s focus on one aspect of their play that has steadily declined since the beginning of the season, special teams. Over the last 13 games, the Isles PP is 4-45 (8.8%), and the PK is 16-40 (60%). One of the main problems the team is having right now is winning face-offs in these crucial situations. Normally I would not give much thought to a stat like face-off winning percentage. In today’s micro-stat environment it seems that any set of numbers could be skewed a certain way to support any argument, but after watching the Isles’ continuously falter on the PK and PP, I’ve decided to back up my “eye test” theory with some concrete numbers. I guess I’m assimilating. To me, face-offs are a complete situational stat. The only real important draws occur when teams are at uneven strength, and right now the Islanders are not giving themselves the best opportunity to dictate the play when either up or down a man. – The Isles’ main center on the power play is John Tavares. #91’s winning percentage on the PP is 44.3, which is actually pretty close to his even strength percentage of 43.3. This is not a good thing. As a number one center, JT has to be better in every aspect at the dot. – The team’s main two centers on the PK, Frans Nielsen & Casey Cizikas, have PK winning percentages of 38.4 & 43.3 respectively. At even strength, both are currently around 49%. I had to run Nielsen’s numbers 3 times before I could actually believe the number was that low. Nielsen is regarded as the team’s best on the draw. It’s amazing how much the drop is when he’s 1 of 4 on the ice. 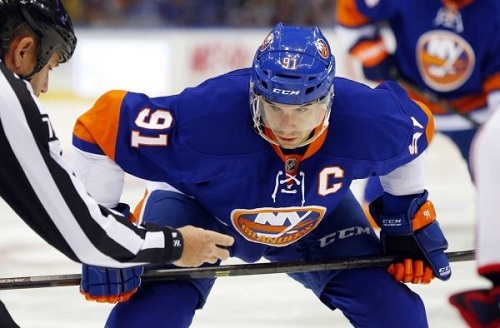 Islanders’ captain John Tavares focuses on taking a face-off. Odds are he probably lost the draw. The first thing that strikes me about these numbers is that the Isle centers are not trying (cheating) enough. One thing I learned with my time in NASCAR is that if you ain’t cheatin’, you ain’t tryin’. I’ve also officiated hockey at levels where centers try to get every possible advantage they can get on a face-off. The Islander’s need to be more aggressive in these situations. Quite simply, they are getting outworked at the dot. Sportsmanship is admirable, but right now it’s not keeping pucks out of the net. If you cheat, you’ll get kicked out of the face-off. I have two answers to this argument. One, officials are much more cautious of kicking out centers on special teams. It’s one thing to toss a center in the neutral zone at even strength, but experienced linesmen are much less inclined to get involved on important face-offs. Special team draws deep in the zone fit in this category. Two, the Isles could start a PP or PK with two centers on the ice. On the PK, this might not seem like the best case scenario, but that initial draw in your own zone is important enough to warrant Nielsen & Cizikas on at the same time to start. This also could help the center’s mindset knowing it’s not the worst thing if he’s tossed from the draw. Win the draw, dump the puck, Cizikas goes for a change. Hey, it can’t get any worse, right? As far as the power play is concerned, the Islanders actually DO have two centers on their 1st power play unit. With Lubomir Visnovsky still sidelined with a concussion, Frans Nielsen has taken up the second defenseman spot next to Andrew MacDonald. Would you believe that as of November 20th, Frans Nielsen has taken 1 face-off on the power play. 1…1….1 I’m speechless. So yeah, Visnovsky’s absence has clearly been detrimental to the power play, and Michael Grabner, who’s speed is integral to the PK, has been in a funk all season, but as an Isles’ fan, you can’t tell me that things will return to normal once these two get back into the swing of things. The Isles are struggling all over the ice, but the special teams HAVE TO get better. There’s my have to.